Perfect for even the most delicate cakes, this 10" springform cake pan ensures that desserts are smooth and pristine after removal. 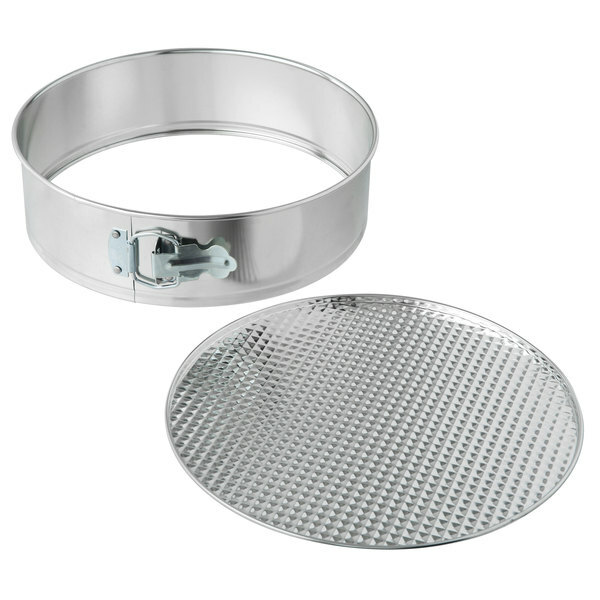 It features a traditional springform design including adjustable sides and a removable bottom, which gently separate from the cake to prevent damage. As a result, it helps ensure that tortes, tarts, cheesecakes, and other delicate desserts slide out of the pan with ease for a beautifully smooth presentation! 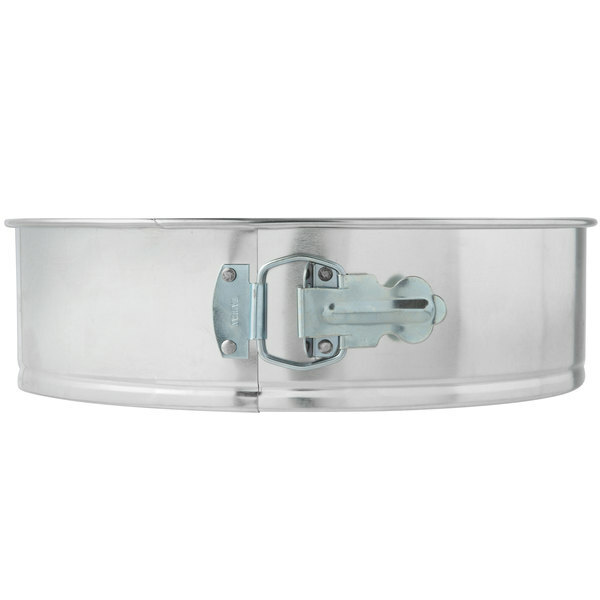 Made of tin, this pan is perfect for light-duty use and is easy to clean after baking. Use it to enhance your menu by whipping up a delicious, creative dish. Try everything from a caramelized-honey nut and seed tart to savory paccheri and cheese with peas and mint! Please spend the extra money to purchase a sturdier pan! These arrived bent and were very thin. They wouldn't have held up well in the kitchen even if they had arrived undamaged. Thank you for the review, Tyler! We're sorry you were not happy with these. A Customer Solutions Representative will contact you shortly! Total waste of money. These are extremely easy to be bent out of shape and don’t form a tight seal at all. They also rust almost immediately and even seem to get a ring of rust around the cake when baking even when using parchment paper to line everything. I used these for one Christmas of cheesecakes and then threw them in the trash. Thank you for your review, Kristin! We are sorry this 10 inch Light Tin Springform Cake Pan has not worked well for you. A Customer Solutions Representative will contact you soon! Arrived with several dents and bumps, and has gotten more worn with only a few uses. Works pretty well, but likely won't stand up to any sort of moderate or heavy use. These tin springform pans are absolutely perfect. They are not expensive, they get the job done and can handle quite a few uses. The only downside is that they rust very easily. Try not to use scrubbers on these when washing- they will last longer. This 10" Light Tin springform cake pan, was not what I expected at all. It dents with any minor bump, very poorly manufactured, would not recommend, sorry. Thank you for the review! We’re sorry this is not working for what you need it for. 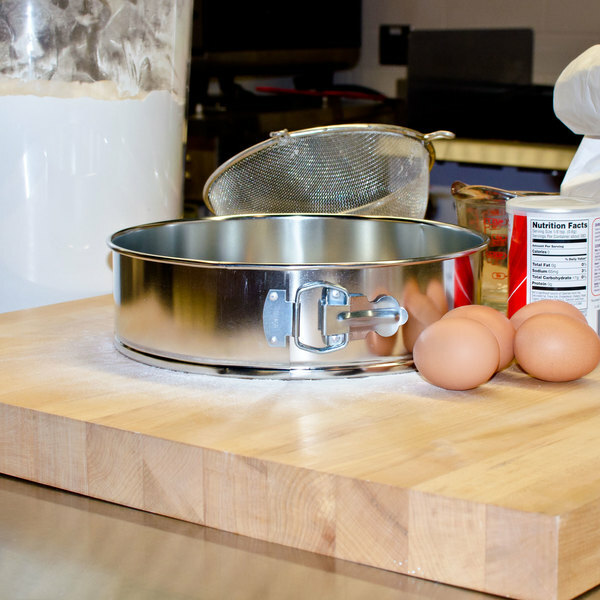 We suggest trying this 10" Heavy Aluminum Springform Cake Pan instead. I read the reviews before purchasing this product hoping they were one offs regarding the durability of the product, but in my experience they were very accurate. The springform pans are great but arrived bent and out of shape. I actually purchased these to slowly replace my current ones, but should’ve gone for the heavier duty version given how easily the springforms can be bent. Does have an issue with sticking so you have to be sure to use a lot of butter, or Pam with it when baking, but overall a good standard springform pan. These springform pans do a great job of making cake removal a breeze. For lots of pastries, it's expensive, but these are only a couple bucks each. 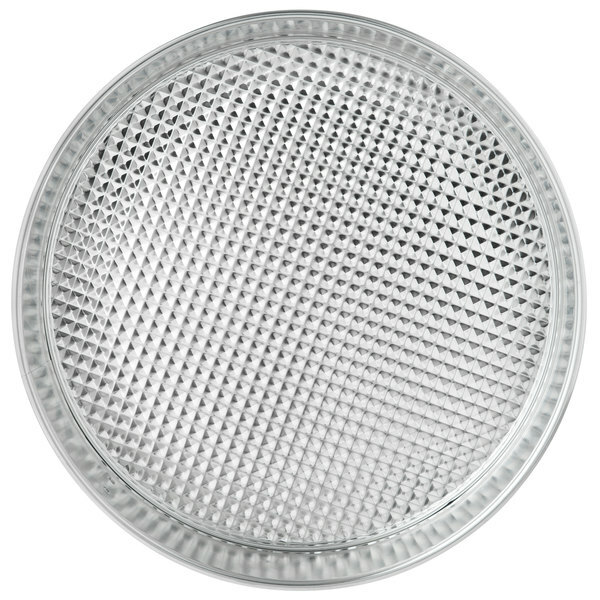 This 10 inch light tin springform cake pan is your basic springform pan and it does the job. For the price you can't beat it! This light tin spring form pan arrived dented up, but i was able to straighten it out easily. It was very affordable and i'm happy with this purchase. Love love love this spring form pan, I didn't realize how much a pan, that's right a pan will make the difference in a cheese cake. Listen bakers out there this is a wonderful pan. I was worried this pan would be to flimsy to bake with when I first received it but it worked perfectly. I made a turtle cheesecake in this pan that baked so nicely. I'll be buying more in other sizes. These spring form pans all came bent and out of shape. They are very thin and it would be worth it to buy the sturdier ones. Thank you for your review, Shane. We are sorry these did not hold up well for you. Please remember to contact our Customer Solutions team right away if you find that your order has been damaged. 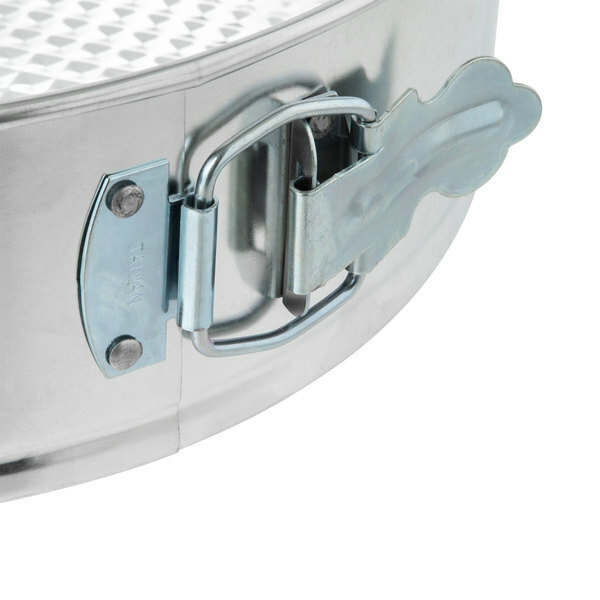 Try this Chicago Metallic 40410 10" Aluminum Springform Cake Pan for a heavier duty pan. This 10" springform pan is great for baking my cheesecakes. The cheesecake comes out clean from the pan every time. The only thing is it is a very lightweight pan and you need to be careful not to bend it when you wash it. these arrived with some damage but they sent replacements immediately after I emailed them a pic of the shipping box and the damage. I kept the bent ones and use them as well. 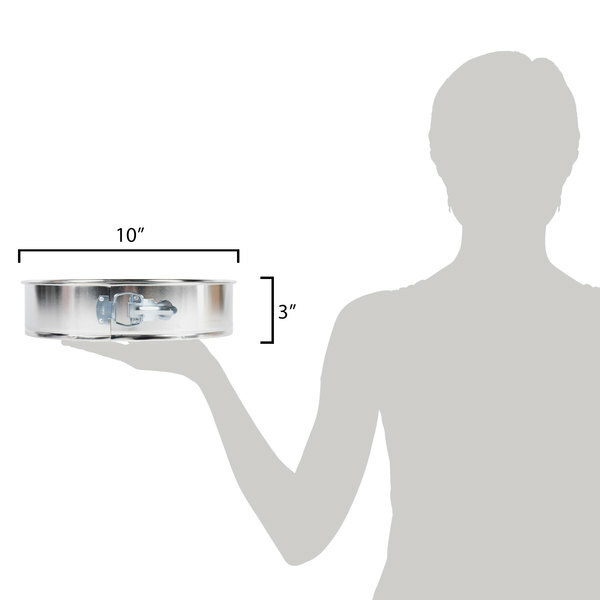 Our chef wanted a springform pan, where do I go but to this webstaurantstore.com where you can get everything under the sun and for good prices. Really love this pan! I make a ton of cheese cakes and I couldn't have done them without this pan. Opens and closes with such ease too! Extremely good for the price, but somewhat prone to bending if not stored properly, as these things tend to be. Make sure to keep it in an appropriate place, and don't put heavy stuff on top of it, and this will last you years. Cleans up very well in the dishwasher too. This is an ok pan. The metal is very thin and easily bends. It's not a problem if you're aware of it. You just have to be gentle with it. Other than that, it works great and is a good buy for the money. Very cheap! At this price I just bought a dozen, Most of them have held up for 6 months or longer! No very strong or durable, but at the price you really don't need to get that many uses to be worth your money! Thank you for submitting a review! We are sorry that these items were damaged in transit, and we will be in touch to coordinate replacements. 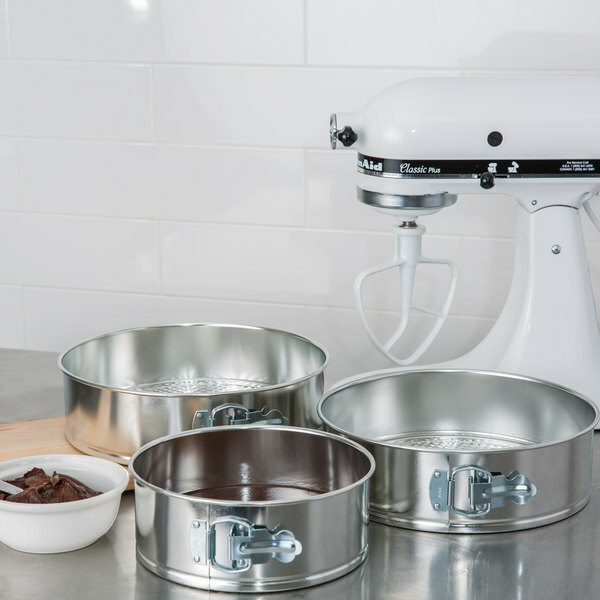 While choosing a cake pan requires some researching, this spring form cake pan can mold great looking and tasting cakes you can offer to your customers and friends. This 10" Springform pan is extremely sturdy and stands up to several different uses. I use the pan to make my famous New York Style cheesecakes where I place the pan in a larger pan of water, to bake the cheesecake. I have never had any problem with water seepage. I also use this pan to make my ice cream cake. The pan is easy to clean and maintain. I bought this springform pan to make my infamous cheesecake! It's a very good pan, but the only complaint I have is that its just a little flimsy. All in all, it's definitely worth the money!